The PT Mobile Trailer Series is an economy on-the-road cleaning system. 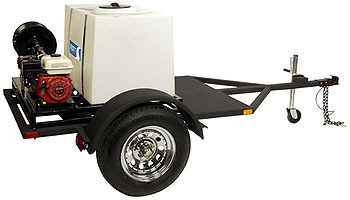 Standard features include powder-coated finish with 3500 lb single axle, 15” wheels, 2” ball receiver, swing up wheel jack, DOT approved running lights, 200 gallon polyethylene water tank with auto fill water inlet. 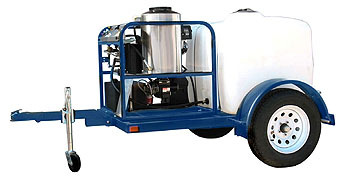 A fully self-contained on-the road cleaning system. Features included tubular steel, four-sided welded construction with powder-coated finish, 15” chrome wheels, electric brakes with breakaway, 2” ball receiver, 230 gallon water tank with auto fill shut-off, dual hose reels with 100 Ft Low and high pressure hose. Select the optional power unit from the Premier Series. 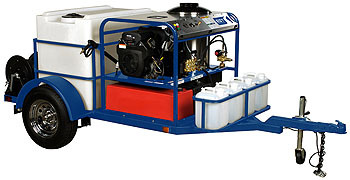 A fully self-contained on-the road cleaning system. Features included tubular steel, four-sided welded construction with powder-coated finish, 15” chrome wheels, electric brakes with breakaway, 2” ball receiver, choice of 330, 460, 535 gallon water tank with auto fill shut-off, dual hose reels with 100 Ft Low and high pressure hose. Select the optional power unit from the Premier Series. Manufactured exclusively to facilitate our MOBILE WASH SYSTEM when an “out-of-vehicle” system is desired. The VDT is constructed of heavy duty 2” x 2” tubular steel frame with four-sided welded construction, with drop axle and black powder-coated finish. Standard features include a 2 ft. x 4 ft. diamond plate work surface for mounting accessories, a swing up wheel jack, 15” chrome wheels and 2” ball receiver. EST’s MOBILE WASH SYSTEM offers innovative new designs in portability for vehicle detailing. 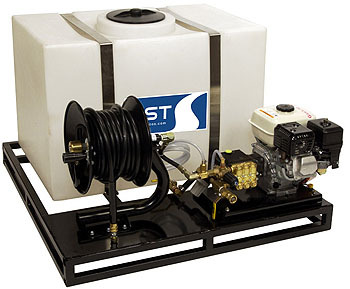 Made to meet the tough demands of everyday use, the MWS standard features include a Honda overhead valve gasoline engine, powerful 3.0 and 4.0 GPM direct drive triplex plunger pump, downstream detergent injector, adjustable pressure regulator, heavy duty hose reel with 50 ft. high pressure hose all mounted to a power plate to reduce shock and vibration. See VEHICLE DETAILING TRAILER for optional trailer mounting when “out-of-vehicle” system is desired.